MNP Poll: Who is your most reliable weatherperson? Tropical storm “Maring” is still affecting most parts of the country after landing over the weekend, bringing in non-stop torrential rains and severe flooding in the Metro and nearby regions. We've seen the network newscasts devoting expanded coverage of the disaster with various reporters deployed in key regions affected by the tropical storm. 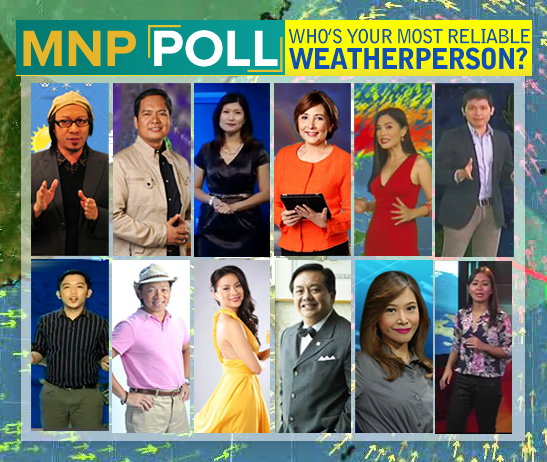 For our brand new MNP Poll, we're asking you this very timely question: Who is your most reliable weatherperson? You have a lot of choices to choose from. There's ABS-CBN's Kim Atienza and his heir apparent Bettina Magsaysay. There's also the GMA Weather team led by the "ekspertong totoo" Nathaniel Cruz and k's Weather's Karen Cardenas. Or maybe you like Mai Rodriguez's delivery on Solar Network News and Pat Fernandez on Solar Daybreak? How about the ANC Newsers Boyet Sison, Gretchen Fullido, and Jekki Pascual? Elsewhere, there's Lourd De Veyra of Aksyon, Lia Cruz, Shawn Yao and Joseph Ubalde of AksyonTV. Make your vote count and let us know your comments by posting in our comment box below, or on our Facebook page and Twitter account @medianewserphil. Who is your most reliable weatherperson?